It’s February 1, which can only mean one thing: the Victoria Film Festival (VFF) is back for another year! Running from Feb. 1 to Feb. 10, the festival is a 10-day extravaganza featuring the cinematic creations of International, Canadian, and independent movie producers and directors. This year, the festival celebrates 25 years — its silver anniversary. According to journalist Michael D. Reid, this was a day many thought would never come. 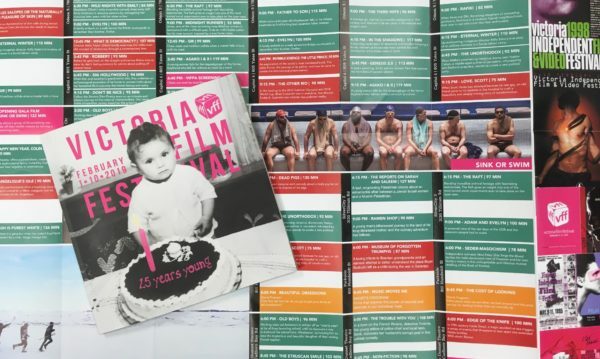 “Naysayers once predicted [the festival] would fade to black, declaring that Victoria was more of a ‘book town’ and couldn’t sustain a film festival this ambitious,” writes Reid in the official VFF program guide. VFF launches tonight with its uproarious opening gala. The theme is disco, and starts at the Victoria Conference by showing one of the festival’s feature films, Sink or Swim, followed by a party at 747 Fort St. The festival’s film roster has a diverse mix of just about everything, from the fast-paced Wall Street-themed The Hummingbird Project featuring Jesse Eisenberg of The Social Network, to the Icelandic survival film Arctic about a pilot who crashes into an abandoned area of snow and ice and is left to his own devices. VFF’s 25th anniversary will be celebrated at the Atrium on Yates Street for the duration of the festival, as the ‘States of Play’ multimedia exhibition highlights modernity and introduces participants to new and different ways of watching film. Many of the installations are participatory, inviting individuals to physically ‘play’ with what is being presented. The Martlet will be attending several of the films this year, which means our readers can expect to see reviews published on our website over the course of the coming weeks. For a full schedule of events, films, and tickets/pass options for this year’s Victoria Film Festival, visit www.victoriafilmfestival.com.